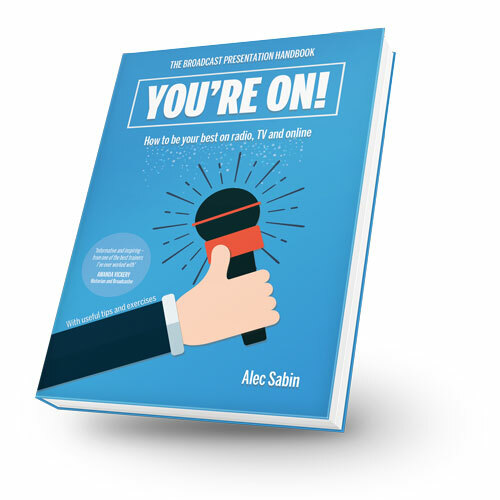 Alec Sabin | You’re On! Since I wrote You’re On! How to Develop Great Media Skills (How To Books, 2009) inevitably there have been changes and developments in the media world. However it is remarkable how much remains the same, especially regarding presentation. Different content and programmes have come to air, and the use of YouTube and social media as well as digital and online activity in general has predictably grown. But the skills required to be your best on the media, whether as reporter, feature journalist, presenter, guest or casual performer are much the same. 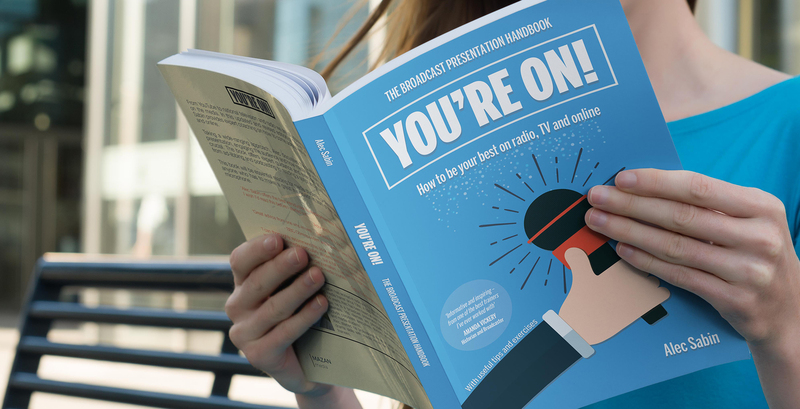 It is for this reason that a broadcast presentation handbook is not only a useful helpmate, but also one that can endure in its appeal to those who need to create, understand or polish their on-air delivery. As a broadcast presentation trainer I wanted to create a toolkit – a useful guide, an educational resource, a training manual, a compendium of practical exercises all in one place. Having a handbook to consult for whatever issue that comes up is, I think, always going to be an asset. And, of course, as a presentation trainer I deal with all sorts of issues which form the basis of the book’s content. I hope that people who find themselves in front of a microphone or camera, who want to establish or perfect the necessary skills, will find what they need here. People who want presentation training do so for a variety of reasons. Some want to be professional presenters, and I certainly address myself to those who want to work as a radio or TV presenter. But I also see this book as being for people from a range of working environments, with differing professional abilities, who commonly have a desire or need to improve their presentation skills in front of the camera or microphone. They may want help dealing with media professionals – how to be an effective interviewee. Experts and academics often want tips when asked to appear as guests on radio or TV. They want to know how they can best get their ideas and information across to a more general audience. Writers and print journalists may want to move into radio or television and so need to master another medium. Others may want to learn effective podcasting. Media and journalism students will need to effectively report and present. Those usually behind the camera and microphone can find out what it is like in front of them. Producers, directors and editors often ask me how to get the best out of their presenters. Actors and other performers may want the challenge to be themselves, for a change, in front of an audience. All kinds of professionals, corporate and management, may want help with making speeches or presentations to groups of colleagues or clients. There is something here for all these people, and though this book focuses on the electronic media, where the audience is not physically in front of the presenter, the techniques discussed will be useful for any presentation, since the principles involved generally apply to all presentation. In my experience as a voice and presentation trainer I have found that when the best work is being done both parties are learning something – both my trainee(s) and myself. There is an exchange. It is true that some of my trainees may be experienced journalists with sophisticated ideas and a good deal of information about interesting parts of the world. I have worked with journalists from all over the globe: Eastern Europe, Russia, Central Asia, Iran, the Arab world, China, South East Asia, North America and many countries in South America and Africa, and obviously there is much for me to learn. But even when I am working with beginners or corporate non-media clients what needs to happen is for them to give me something. As a trainer I become a professional listener, and when asked, as I sometimes am, to judge someone’s performance on air, I usually say that I do not ‘do’ judge: I am a facilitator. My role, as audience, is to ask ‘am I being served?’ and if not, why not; and I then try, with my trainee, to look at ways to correct that. But they are the judge of their own presentation. This book therefore is for those with something to give. You may not know exactly what that is. It may need to be worked on, thought about, written, corrected. But the desire to express it is already there. I can help you get that across through the electronic media. The presentation of your material is what concerns me, and should concern you. Here are some ideas about how you can improve your performance. Is Good Presentation Science or Art? Why do Broadcasters need Voice Training? You often feel nervous or are overcome by nerves. You feel you’re not being yourself, or natural. You tend to go too quickly. You can’t control the speed. You feel your delivery is unusual. People don’t understand you the first time. Your voice is too weak or high-pitched. You feel you sound too young or lack authority. It sounds boring or monotone. How do you spice it up? You tend to ramble. Your message needs honing.